In the first two posts of this series where in we are creating a Hill Climb Racing Game like 2D car physics in a side view, we learned, how to create a physically stable 2D Car and added the functionality of controlling it via C# script. In this post we will add engine sound effect to our 2D Car. 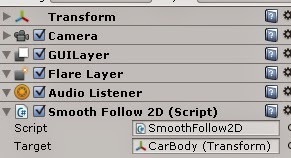 The first thing you need to do is to attach an Audio Source to the CarBody object. To do this simply select the CarBody in the Hierarchy and click on Add Component and search Audio Source. In case you are wondering what is an Audio Source and what does it do? Audio Source, as the name suggests is the source which generates Audio. You need to have an Audio Listener in your scene as well, which, obviously would listen to the Audio. By default, you will have an Audio Listener attached to your Main Camera. In case, you have deleted the Main Camera and added another camera, do add Audio Listener component to it. This Audio Source attached to the CarBody would expect you to give it an Audio Clip which is to be played. Download this engine sound Audio Clip ( or you can add your own made engine sound clip as well ) and add it to the the Audio Clip field of the audio source. Save the script and return to Unity and test the scene. On doing so, you would notice that the car engine has an idle engine sound. On pressing the left or right arrow keys, you would notice that the car has a nice acceleration sound which increases as the speed increases. And obviously it will be clamped to the highPitch and lowPitch values. 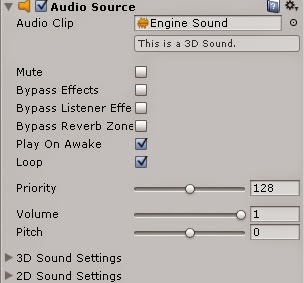 There is one more thing you would have noticed while testing the scene, the pitch of the audio moves back to the idle engine sound after a fraction of a second when you do not press the keys anymore. It is just like what happens in reality, you accelerate and the engine makes sound. If you remove your foot from the acceleration pedal, it doesn't make that sound anymore. This is all we had in this post. I'm not sure if I would be posting anymore posts in this series, but yeah I'll see you around. You can add a button and add a Pointer Down event to that button.. You can define a class variable to store the input value and modify it in your Pointer down event method..
2. Choose Event -> Event Trigger . 4. The event you want is called Pointer Down. Form the mobile mechanic Phoenix, AZ you can get the arrangement of your are vehicle care and its redesigning issue, this individual is a bargain a wide range of vehicle administrations which is used for enumerating your vehicle. So on the off chance that you need to fabricate your vehicle excessively flawless and help its execution by upgrading its element than this individual will propose you the better exhort. Sujit you are awesome, nice tutorial i have completed successfully. hi, the car isnt moving, how do i do this? it is easy to look for high-quality SOUNDEXPERTS.ORG/BEST-6x9-SPEAKERS systems regardless of whether it is for replacement purposes or just to have your current program upgraded.